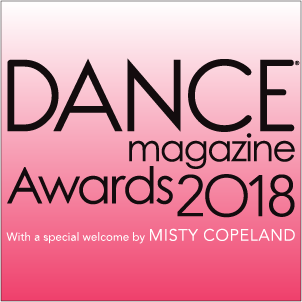 Misty Copeland will open the 61st annual Dance Magazine Awards. The evening will honor Ronald K. Brown (presented by Arcell Cabuag), Lourdes Lopez (presented by Darren Walker), Crystal Pite (presented by Seán Curran), and Michael Trusnovec (presented by Patrick Corbin). A special Leadership Award will be presented to Nigel Redden (presented by Frederic Seegal). The show includes performances by Hubbard Street Dance Chicago, Paul Taylor Dance Company, Miami City Ballet, Gallim, and Evidence, A Dance Company. The Harkness Promise Award will shine a light on two emerging young artists for the promise of their artistic work. The inaugural awardees are Raja Feather Kelly and Ephrat "Bounce" Asherie. Proceeds from this year's Dance Magazine Awards will be applied to next year's Harkness Promise Awards. Tickets start at $50 for the show and post-awards party.